SupersizedMeals.com - Behold! 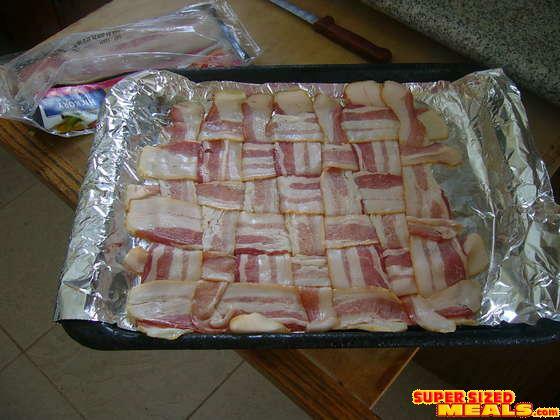 Bacon Placemats! [via Slashfood] Placemats. Usually used to collect food that falls off the plate rather than be a foodstuff itself. 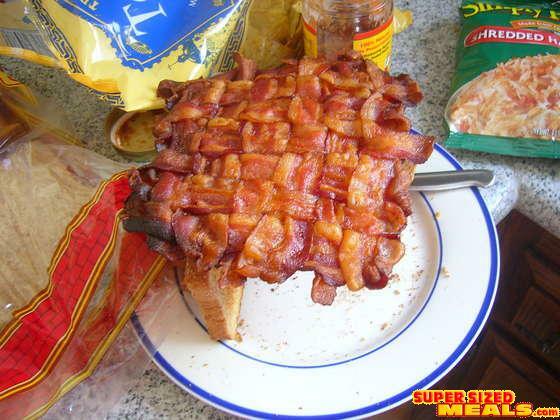 This creative chap decided to make a common household textile out of bacon, a placemat in this case. And if you drop some sort of tasty snack on this placemat, who cares? Just eat the lot! 1 Package of sliced Bacon (at least 12 slices) -- any bacon will do, even blasphemous turkey bacon. Foil your baking sheet/pan -- then apply a little butter (this gets the cooking process going until some fat renders off the bacon). Weave using an over/under pattern making a 6X6 matrix. Make it as tight as possible with minimal overlap. If your bacon strips have a wider side -- flip between wide and thin as you weave. This ensures your mat is not lopsided. Remember that bacon shrinks when cooked; this pulls the weave even tighter strengthening the structure. 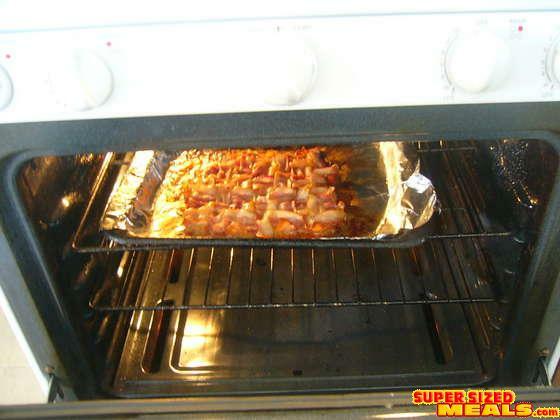 Bake in your preheated oven for about 20 to 30 minutes (depending on how crispy you like your bacon). Be conscious of your bacon and pull it out when it's done. It should turn that dark bacon color we all know and love. No, that's not slang to "The oiling" -- remove your bacon from the oven. 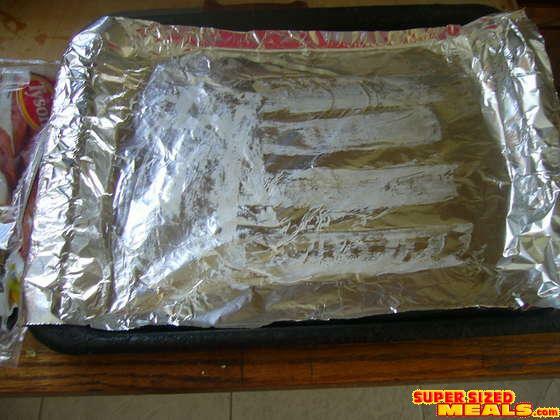 Then, using a spatula -- move to a paper towel covered plate. 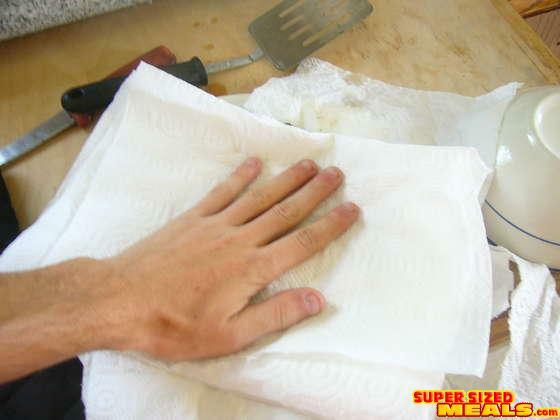 Then add some paper towels on top and gently press down to soak up more excess fats. After a minute or so, change or flip your towels. Now, if you want a stiffer mat. Allow the bacon to sit out for 10 minutes or so. You can then use your bacon as a roof for your hot dog log cabin. You can also experiment with bacon shapes. Woven Bacon Bowls made with turkey bacon are indeed successful. And that was done in the microwave! If you want to experiment with shapes simple press your bacon mat onto the outside of a bowl or other mold while you let it stiffen. Then load it up with potatoes, toast, jam and eggs for your "tune-up breakfast." Seriously, eating a whole bacon mat (1 package of bacon) on slices of toast is probably not a good idea.... Trust me, I know. But it did look really cool on a toast hut using toasted bread joinery!